Pioneers in the industry, we offer vertical rotary glass vial washing machine from India. "Harsiddh" Vertical Rotary Glass Vial Washing Machine is specially designed to wash Vial with minimum contact of machine parts with Vials. 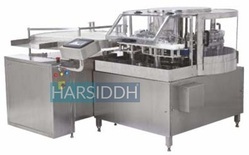 Machine with specially designed Gripper system holds the Vial from Neck and invert the Vial till the washing operation completed and again after washing release the Vial on out feed feed worm system in vertical position ensures positive wash of Vials. Vial feeds through feed worm to in feed Star Wheel and specially designed Gripper hold the Vial from neck and invert the Vial and move it further on rotary moving system for washing process. Vials traveling in neck down position above washing needles and moves along with the Needle bar ensures maximum time for washing once the needle enter in the Vial neck. Machine with Standard Six different Washing Stations each of 6 Needle for optimum Washing and the sequence can be change as per customer’s requirement. Machine also having external wash for optimum washing of Vial. All contact parts with the internal surface of Container and the wash media are made from AISI 316L Stainless Steel. Suitable for 2ml to 100ml Vials. Washing sequence can be made as per customer’s requirements. Automatic Infeed and Exit of Ampoules/Vials. in feed star wheel. The Grippers picks up the Vial from Infeed Star Wheel and invert it in neck down position over washing needles and move along with the needle bar for Washing. On completion of a cycle, washed Vials are again inverted to neck upward position and feed to output star wheel. Washed Vials received from output star wheel can be collected on Output Tray or can be pushed to sterilizing tunnel. A separate pumping station (optional) gives the right quantum of water at the desired pressure.